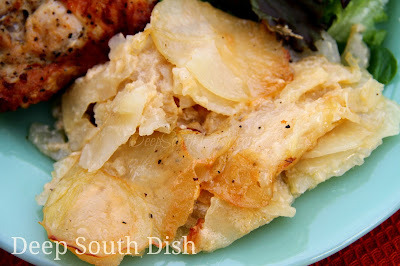 Thin slices of seasoned potatoes, layered with onion and baked in a buttery milk sauce. I grew up with two basic potato casseroles. One that was made with a buttery milk sauce that my Mama called scalloped potatoes; the other made similar but adding in cheese, that we called potatoes au gratin. I used to love it when Mama made them. Both are just simply heartwarming and delicious and a perfect potato side dish for cooler weather. I'm talking about made from scratch and really not all that time consuming to be honest, especially if you have a mandoline (and I highly recommend you get one) and worth every single second. A favorite holiday side dish, although they also go wonderful with baked or grilled chicken, fried chicken or pan fried pork chops, and are a perfect fall or winter side dish with many other dinners. To save a lot of work, slice your potatoes using a food processor, or pick up an inexpensive mandolin like that pictured above. They are worth having, you will speed through prep like nobody's business, all slices will be uniformly thick, meaning that they will all cook in the same amount of time, and a mandolin is much less hassle to clean. Just take care with your fingers and your knuckles y'all, because they are very sharp! 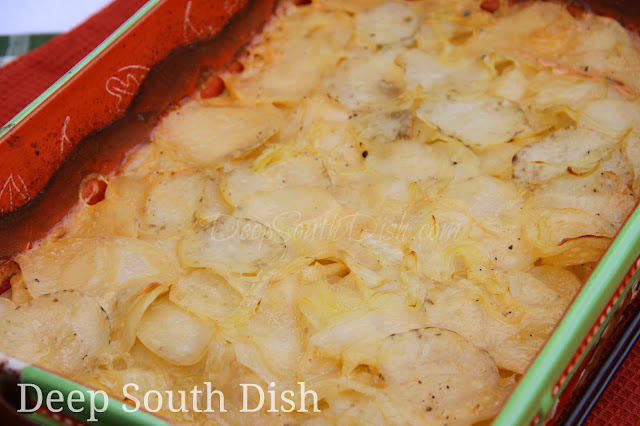 This recipe makes about 4 servings so if you need to feed 6 or more people I recommend making two separate casseroles, rather than a single, large multi-layered dish to ensure the potatoes cook through well. 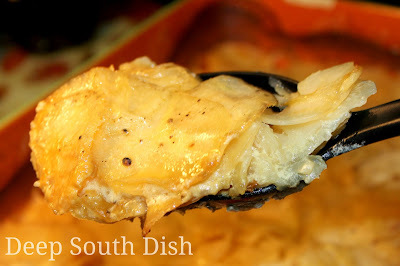 To make this recipe au gratin, see notes at the bottom of the recipe - you'll be layering in one cup of grated Swiss cheese, or use your favorite cheese, or check out my recipe for Perfectly Cheesy Potatoes au Gratin while you're here too! For more of my favorite potato recipes, visit my page on Pinterest! Preheat oven to 375 degrees F. Lightly smash and peel the garlic; rub all over a 9 x 13 inch baking dish. Butter the dish with 1 tablespoon of the butter and set aside. Peel the potatoes and slice thin, about 1/4 inch. A mandolin works fantastic for this. Hold the potatoes in a bowl of cool water to which 1/2 teaspoon of salt has been added; set aside. When ready to bake the casserole, drain potatoes, transfer to a clean dish towel and pat to dry. Heat the remaining butter with the milk until the butter is melted and the milk hot. Heat the olive oil over medium heat and saute the onion until cooked, but not browned. Layer 1/2 of the onion in the bottom of the baking dish. Add 1/2 of the potatoes on top of the onion. Split the remaining onion in half and set aside. Combine salt, pepper and Cajun seasoning and season potatoes with half; top with half of the remaining onion, then the remaining potatoes, seasonings and onions. Pour the hot milk and butter combination evenly over the top of the casserole, cover tightly and bake in the upper third of the oven, at 375 degrees F for 45 minutes, uncover, and return to oven for an additional 15 minutes, or until until milk has been absorbed and potatoes are soft. May pass under the broiler to brown top further. Serves about 4 - make two pans for a larger serving. Cook's Notes: If you like the potatoes sliced thicker, or you don't have a mandolin, cut them about 1/4 inch thick, place them into a pot, cover with water and bring to a boil. Immediately turn off the heat, remove pot from the burner, and let them sit in the water for 5 minutes. Drain well, then proceed with recipe. To Make This Au Gratin: For potatoes au gratin, add 2-1/2 cups of shredded Swiss, sharp Cheddar cheese, or use your favorite cheeses or any combination of cheeses. Omit the onion if desired, divide the cheese into thirds, setting aside one third for topping the casserole. Layer 1/2 of the potatoes in the bottom of the buttered baking dish. Season with salt and pepper to taste and sprinkle about 1/3 of the remaining cheese on top. Repeat the layer of potatoes, salt and pepper and another 1/3 of the cheese. Reserve the last 1/3 of the shredded cheese for the last few minutes of cooking when you'll return the casserole to the oven for about 5 minutes, or until cheese is melted. 21 HUNGRY PEOPLE COMMENTED. ADD YOURS! Definitely add cheese to mine...love me some taters, just about any old way ya make um! Looks so good. I've always wanted to make them but was afraid of how they would turn out. Will definetly have to try nowthat it looks so easy. I have a very similar recipe and love it. This looks yummy. Tummy's rumbling over here. It looks heavenly! I really need to get a mandolin so I can make this!! Bless the Lord! SOMEONE knows the difference between scalloped potatoes and au gratin! What is not to love about these potatoes?! They were delicious and we especially loved the onions too. I added the Slap Ya Momma seasoning as well. As I'm learning here, that little can of evaporated milk is a pretty cool ingredient! A very tasty and comforting dish, thank you so much! Evaporated milk sure is great with potatoes for sure! I LOVE this dish myself. So glad to hear y'all did too Mellie!! Can I use regular milk in substitute for evaporated milk? Do you have a different substitute?? I like to use evaporated milk because it has a creamier result due to the water being removed. I would recommend substituting whole milk rather than a lower fat milk, because the lower fat milks contain water. So I just winged this from my memory as a youngster—-and did not pre-cook or parboil the potatoes or the milk. How long do you think I should bake this ? Depending on how the amount of ingredients compare and also how thick you cut the potatoes, roughly the same as the recipe except that with cold milk you may need to add a few minutes. 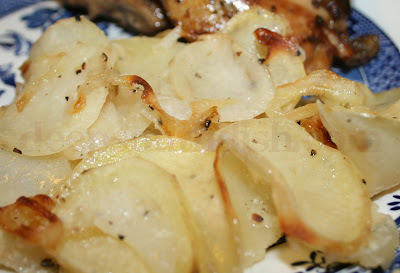 Check the potatoes in the center at the end of the cooking time for tenderness, adding more time if needed. I used to make scallops potatoes almost 40 years ago. I doubled the butter. If you are a butter fan add more. I like this recipe.